In a frying pan, add oil and sautée spinach and garlic for 2 minutes. Set aside. 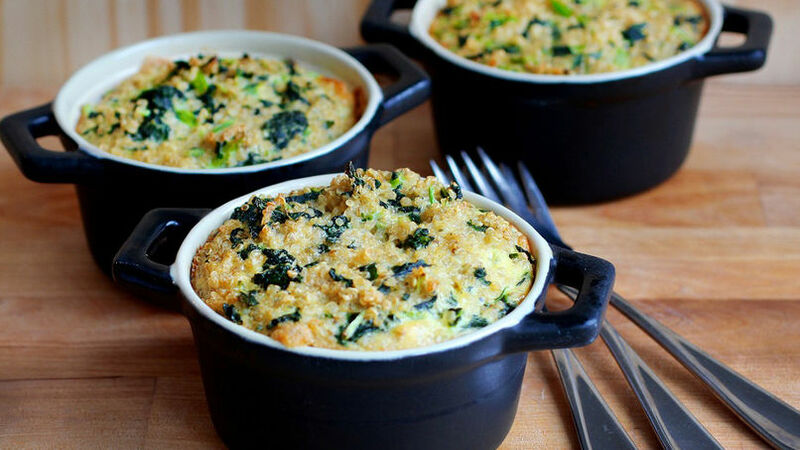 In a large bowl, beat the eggs and combine with quinoa, spinach and garlic, parsley, onion, cheese, salt and pepper. Line a muffin tin with paper liners or spray with nonstick cooking spray and add egg and quinoa mixture. Bake for 12-15 minutes or until they set. For a flavor variation, use kale or any other vegetable you prefer. This quinoa breakfast omelet is easy to make and very nutritious. The best part about this recipe is that you can use leftover quinoa for a nutritious and delicious recipe. You can easily adjust the recipe depending on the number of people.